Last year, I wrote an article on cerebral small vessel disease, a very common condition in which the small blood vessels of the brain develop signs of damage. If you’re an older adult and you’ve had an MRI done of your brain, chances are pretty good that your scan showed signs of at least mild signs of this condition; one study of older adults aged 60-90 found that 95% of them showed signs of these changes. These are basically like teensy strokes in the brain. Most are un-noticeable to people, but if you have enough of them, you can certainly develop symptoms, such as cognitive impairment, balance problems, or even vascular dementia. As I explain in the article and the comments, the first thing to do is to work closely with your doctors to understand what is the likely cause of the damage to the brain’s small blood vessels. Now, when you do this, you may well find that your doctor just shrugs, or waves off the question. That’s because in most people, cerebral small vessel disease is thought to be in large part a result of atherosclerosis (more on this term below) affecting the smaller arteries of the brain. And atherosclerosis affects just about everyone as they age, because it’s related to many basic cardiovascular risk factors that become very common in late-life. So in many cases, asking the doctor why you have signs of cerebral small vessel disease may be like asking why you might have high blood pressure, or arthritis. These are common conditions and they are usually due to medically mundane causes and risk factors, including sub-optimal “lifestyle” behaviors and the general “wear and tear” on the body that is associated with aging. Whether you are younger (i.e under age 60) or older, always start by asking your doctors what they think are the most likely causes for any cerebral small vessel disease, and what they recommend you do to slow the progression. And for most people, the main advice will be this: evaluate and address your cardiovascular risk factors. “Vascular,” as you probably already know, means “blood vessels.” And blood vessels are critical to the function of every part of the body, because blood vessels are what brings oxygen and nutrients to every cell in the body. They also carry away waste products and toxins. So, blood vessel health is key to brain health. Note: Experts who study cerebral small vessel disease believe the story of what might be causing it is more complicated. That said, identifying and managing one’s cardiovascular risk factors is currently the mainstay of treatment and is likely to remain so. If you want to learn more about causes and contributors to cerebral small vessel disease, see here: Cardiovascular risk factors and small vessel disease of the brain: Blood pressure, white matter lesions, and functional decline in older persons. Lots of factors affect the health and function of your blood vessels. Before we dive into specific factors, let me share some practical ways to think about these risk factors. A form of inflammation: “Inflammation” basically means that aspects of the body’s immune system are revved up. In the short-term, this helps fight infections, but in the longer-term, this actually creates a fair amount of wear and tear on cells in the body. Inflammation can also cause the blood vessels to build up plaque. Inflammation is manifested in the body in many different ways. These include having higher levels of certain proteins, such as C-reactive protein, and/or by the increased presence of certain types of white blood cells. For more, see What is Inflammation? A form of mechanical stress: This means physical forces — such as higher blood pressure — that create wear and tear on blood vessels. A form of mechanical obstruction: This means build-up on blood vessel walls (sometimes called “plaques”) or blockages of blood vessels. A narrower blood vessel cannot transport oxygen, nutrients, or waste products as effectively as before. Plaques can also break off and then block a downstream part of the blood vessel; this can cause strokes or heart attacks. Some risk factors will fall into more than one category. Atherosclerosis (and its related term, arteriosclerosis) means the process of artery walls becoming inflamed, thickened (by plaques), and then hardened. Calcium is often deposited into the blood vessel wall, which contributes to stiffening and “calcification.” This process of accumulating damage happens over years and years, and is influenced by lifestyle factors, medical conditions, and other health factors. In short, atherosclerosis is the most common way that blood vessels become slowly damaged and obstructed over time, and this process happens in large part due to chronic exposure to inflammation and mechanical stress. Hardened arteries will contribute to higher blood pressure. Having a lot of atherosclerosis is also understandably a strong risk factor for developing problems related to blood vessels, such as heart attacks and strokes. Damaged blood vessels also tend to become less resilient, and so they are also more prone to break or burst. Such breakages can be the underlying cause of ruptured aneurysms and certain forms of stroke. Lots of diseases fall into this category, including diabetes and most auto-immune diseases. Mental health conditions such as depression or anxiety may also qualify, as these are associated with increased stress levels in the body. Health conditions that are often caused by damage to blood vessels. This includes chronic kidney disease, which often — but not always — is related to blood vessel health, as well as peripheral artery disease. Probably the top risk factor having a cardiovascular event is having had one in the past. The Rotterdam Study, among others, has found that a history of stroke or heart attack is associated with more signs of cerebral small vessel disease on MRI. Now that we’ve covered the broader categories of what affects blood vessel health, below is a list of the most common and important specific risk factors. If you’ve been worried about cerebral small vessel disease, these are probably the risk factors you’ll want to be discussing with your doctors. This list is based in large part on the Uptodate.com chapter on established cardiovascular risk factors. Now, you may be wondering: how are each of these risk factors defined? What blood pressure is high, or “too high”? What constitutes “insufficient exercise”? This is where things get tricky. Basically, almost all of these risk factors can be thought of as a risk spectrum, with one side indicating increased cardiovascular risk and the other side associated with less risk. (Although for some factors, extremes on either side are associated with risk). Where exactly to place a numerical cut-off, for the purpose of defining a disease — e.g. defining “hypertension” — tends to be hotly debated by experts. Similarly, there is often debate as to what constitutes an “optimal range,” or “optimal intake” (for diet and exercise factors), in terms of minimizing cardiovascular risk. Within this article, it’s not possible to present each factor in depth. Still, here’s a more detailed version of the list with some practical information for each, along with some relevant resources. Then in the next section, I’ll cover five key approaches, which can address many cardiovascular risk factors simultaneously. Higher is generally riskier, lower generally corresponds to lower CV risk. Treatment of high blood pressure has been associated with a reduction in CV risk. In general, higher levels of total cholesterol, LDL cholesterol, and/or triglycerides have been associated with higher CV risk. Recent guidelines on lipid-lowering recommend basing treatment on a person’s 10-year risk of cardiovascular disease, rather than solely focusing on aiming to get cholesterol below a specific number. Randomized trials find that treatment of elevated cholesterol (with statins) does reduce CV risk in many people. Research also finds that cholesterol levels can be lowered through lifestyle modifications (e.g. changes to diet, weight, and physical activity). Higher levels of blood sugar — which usually indicates pre-diabetes or diabetes — are associated with higher CV risk. Elevated blood sugar after meals has been associated with increased CV risk, and may be an important risk factor in of itself. Controlling blood sugar in people with diabetes has been shown to reduce CV risk. That said, studies find that reducing blood sugar too much via medication is also associated with increased cardiovascular risk (see here and here). Research suggests that a hemoglobin A1C of 7-7.5% may be safer than using glucose-lowering medications to get the hemoglobin A1C below 7. People with diabetes should avoid frequent hypoglycemia. Insulin is a hormone that enables the body’s cell to absorb and use glucose. Higher insulin levels are associated with insulin resistance and pre-diabetes. For more information: Prediabetes & Insulin Resistance. Chronic kidney disease (usually defined as having an estimated glomerular filtration rate that is chronically less than 60mL/minute) has been associated with increased risk of CV disease. A glomerular filtration rate of 90-120 mL/minute is normal, and a rate of 60-90 mL/minute is usually considered mild loss of kidney function. For more on chronic kidney disease, including how to diagnose and manage it: What Is Chronic Kidney Disease? A higher body-mass index (BMI) has generally been correlated with a higher risk CV disease, as in this study. Obesity increases the likelihood of developing other conditions that increase CV risk, including high blood pressure, high cholesterol, insulin resistance, and diabetes. Being overweight does seem to become less risky as one ages; learn more about the “obesity paradox” here and here. Some experts also believe that waist circumference is a more useful measurement than BMI in older people. Smoking cigarettes is a well-established and strong risk factor for CV disease. The CDC estimates that smoking causes one in three deaths from cardiovascular disease. Second-hand smoke exposure is also associated with CV risk. Smoking is also known to particularly cause damage and inflammation to blood vessels. Research finds that quitting at any age helps people live longer. C-reactive protein C-reactive protein is synthesized by the liver and is considered a good marker of inflammation in the body. Higher levels of C-reactive protein can be caused by a variety of specific health conditions. They may also reflect more generalized chronic inflammation in the body. 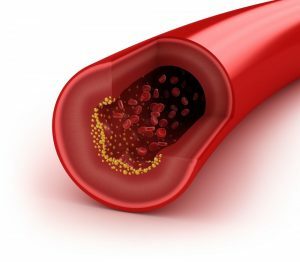 Research has found that C-reactive protein levels often correlate with the degree of existing atherosclerosis in a person’s blood vessels, and also with the risk of future CV events. Statins have been shown to lower C-reactive protein levels, independent of their effect on LDL cholesterol levels. This may be part of the way that statins reduce the risk of CV events. People with OSA have a higher risk of experiencing CV events. Treatment of OSA has been associated with improvement in high blood pressure and some other cardiovascular factors. However, a recent meta-analysis found that OSA treatment with positive airway pressure did not result in fewer CV events. Research has linked psychological conditions, including depression, anxiety, and chronic stress, to CV risk. A randomized study found that stress-management training was associated with improved markers of CV risk, in people with pre-existing heart disease. Another study found that depression treatment reduce the risk of a first CV event. Generally, greater amounts of exercise and regular physical activity correlate with decreased CV risk, as noted in this study. A recently published analysis of data from the LIFE randomized trial found that in a previously sedentary group aged 70-89, increased physical activity (as measured by a wearable device) did correspond to a lower risk of experiencing cardiovascular events. Guidelines generally recommend that people aim for 150 min/week of moderate aerobic physical activity, or 75 min/week of vigorous aerobic activity. However, research suggests that lesser amount of exercise also can provide benefit, so some exercise is always better than none. For a review of the effect of exercise on cardiovascular outcomes, see here. Research generally suggests that higher intakes of dietary fiber, fruits, and vegetables are associated with a lower risk of CV disease. Newer research suggests that the benefits of these foods is at least in part due to their impact on the gut microbiota (the “good bacteria” in every person’s gut). Research also suggests that a plant-based diet (one with no or minimal animal products, and minimal processed foods) can lead to significant reductions in CV risk. Red meat consumption has been associated with a higher risk of CV disease in some research, including this study. The risks and benefits of eating different types of fat or other animal products remain debated. Although many observational studies suggest that diets with a lower glycemic load are associated with lower CV risk, randomized trials have not always confirmed that such diets improve CV risk markers such as cholesterol or inflammation markers. A very interesting study published in 2015 found that individuals have very different blood sugar responses to the same meal. This suggests that low glycemic diets may be more effective for some people than for others. CV risk generally goes up as people get older. CV risk factors affect both genders but may do so differently, depending on the factor. Again, if you’ve become concerned because brain scans have shown signs of cerebral small vessel disease, your very first step should be to talk to your healthcare providers. Ask them what they think are the most likely causes of the brain changes that are visible on the scans. No matter what they say, you’ll probably still want to review and address cardiovascular risk factors. Now how should you do this? You might think that the answer is to work away to evaluate and treat each one of those factors. That’s not necessarily a bad idea, but it can be quite labor-intensive. It also carries the risk of “falling down the rabbit hole,” since exactly how to treat some of these risk factors — such as cholesterol — is hotly debated by medical experts. So instead of delving into the nitty-gritty and attempting to optimize each risk factor, I recommend starting by considering a handful of high-yield “better health” approaches. Studies generally find that these do correspond with lower cardiovascular risk. Below are my top recommendations. These are beneficial to most older adults. Check with your doctors to confirm that this approach is likely to benefit you or your older relative, or to troubleshoot any concerns or questions you might have. If you’re a smoker, stopping is one of the most powerful ways to reduce inflammation in your blood vessels, so get help quitting smoking. If you live with a smoker, see if you can persuade that person to stop, for their own health and for yours. Quitting smoking will improve lung function within days, and will reduce cancer risk. It will also save you money. For resources on helping older adults quit: Quitting Smoking for Older Adults. Most older adults don’t currently get the recommended amount of exercise (150 min/wk of moderate exercise or 75 min/wk of vigorous exercise). It’s generally best to start by assessing one’s current level of exercise, and then making an effort to modestly increase one’s weekly exercise. A step-tracker is often very helpful. Trying to walk more is a good goal for many older adults. Sedentary older adults may benefit from enrolling in programs to help them exercise. If pain, shortness of breath, falls, or other problems are limiting one’s ability to walk or do other exercise, be sure to ask your health providers for help. Increased exercise has been associated with countless benefits, including maintenance of mobility, improved mood, better sleep, better brain function, and more. For more on exercise in later life, including the four types of exercise all older adults need, see: Go4Life from the National Institute on Aging. Eat lots of vegetables, greens, fruits, whole grains, beans, and lentils. Such plant foods provide crucial fiber, vitamins, and minerals. Eating them has also been associated with a healthier microbiome (the good bacteria in the gut, which we are realizing play a key role in managing the immune system and inflammation). For vegetables, emphasize non-starchy ones (potatoes don’t count!) and try to include several different types, such as leafy greens, cruciferous vegetables (broccoli, cauliflower, etc), orange/red vegetables (carrots, beets). Minimize added sugars, fast food, and processed foods, including processed meats. Minimize simple starches (e.g. refined flour, most sweets), especially if your bloodwork suggests problems managing blood sugar. People with high blood pressure often benefit from a diet lower in sodium. Research suggests that a person’s response to diet is highly individual. Before persisting with a certain dietary plan, it may be good to ask your clinicians for help determining whether your body is responding well to a certain diet. A healthier diet often is associated with benefits beyond cardiovascular health. These may include improved mood, increased energy, easier weight loss, decreased constipation, and more. Seek out and maintain social connections and purpose. Relationships, purpose, and feeling that one is contributing help older adults feel their best, and are also associated with better health outcomes. Making an effort to reconnect or improve connections with family and friends. Seeking work or volunteering opportunities. Signing up for an exercise class, educational activity, or other activity, whether designed for older adults or for the general public. Participating in activities at one’s local center for older adults. Considering relocation to a more supportive community or environment, if one is often physically isolated due to transportation issues or the location of one’s home. Identifying a cause or project to work on. Participating in a local church or spiritual community. Be sure to talk to a doctor or other clinician, if physical or mental health symptoms are interfering with the ability to participate in activities. Mental health symptoms such as frequent sadness or lack of interest in things may be a sign of depression, and should be evaluated. Difficulties with memory or thinking should also be medically evaluated. Social connections and maintaining purpose are key factors in maintaining a sense of well-being in late-life. For more on addressing loneliness or social isolation, see the resources listed here: Addressing Loneliness in Aging. Use non-drug methods to manage stress, anxiety, and insomnia. Several different methods can be used to manage the mind and one’s mental state. It is often a good idea to use them in combination. Clinicians and other experts can help you determine which combination is best for whatever mind problem is most troublesome to you. Older adults with sleep problems should be properly evaluated for underlying medical problems, as these are common and may require treatment directed at these problems. For more, see 5 Top Causes of Sleep Problems in Aging, & Proven Ways to Treat Insomnia. Most of the methods above are generally associated with better overall well-being and health. Most medications — whether prescription or over-the-counter — used to treat anxiety, stress, or insomnia affect brain function and balance in older adults. Learning to manage these common problems without medication can reduce fall risk and help preserve brain function. Most people are well aware of numbers 1, 2, 3, 4, and some have also heard of the various “lifestyle” approaches to managing stress and insomnia. But far too few people are trying to put these in action. Which is a shame, because in many cases these approaches work as well as medications do. But they are better, because they bring on lots of bonus benefits. And they are safer, because they can enable older adults to manage cardiovascular risks and other aspects of health with fewer drugs. Don’t make the mistake that many people make. Yes, you can try to tinker with each cardiovascular risk factor one at a time. And yes, there are plenty of health providers out there who will offer you lots of testing, and probably some prescription medications. There is a certainly a role for such tests and medications. But before you go too far along that route, remember that it’s always worthwhile to start with healthy, holistic approaches to taking care of one’s physical and mental health. That is usually what is best and most effective, for the brain, the heart, and the aging body. 12 Risks to Know & 5 Things to Do appeared first on Better Health While Aging.